EXPECT somebody to kiss the canvas when former WBO Oriental titleholder Jun ‘‘Hercules’’ Doliguez and former WBC International king Dennis ‘‘Scorpion’’ Tubieron clash on September 26, Friday at the Mandaluyong Gym. Though this is a non-title bout, the result of the explosive encounter between two world-class fighters will be crucial as both Doliguez and Tubieron chase the world title. Originally, the bout was scheduled last September 19 but it was postponed due to Typhoon Mario. ‘‘I’m ready sir,’’ said Doliguez, who fought in the United States and Mexico. 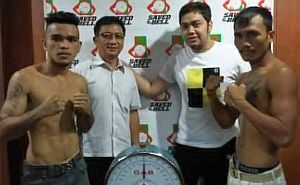 The pride of Saved by the Bell Promotion under Elmer Anuran and Touch Gloves Boxing Gym in Agoncillo, Batangas admits that Tubieron is a very tough and dangerous foe. Both boxers made the 122 lbs. limit during the September 18s weigh-in at the Games and Amusements Board. GAB boxing chief Dr. Nasser Cruz, Elmer and Danny Anuran witnessed the weigh-in. Also present were trainers and future world champions. Anuran said his ward will be tested by Tubieron. ‘‘SBB will give its boxers highly-qualified foes in order to thrill the fans,’’ said the youthful Anuran, who is known for promoting action-packed boxing extravaganza. ‘‘This fight will be very exciting because both boxers are raring to score a win. This is going to a thrilling fight,’’ said Anuran. For his part, Tubieron said he trained very hard. ‘‘Doliguez is world class and I want to beat him. Yes, I respect him but I want to win the world title someday and winning is a big step towards achieving my goal,’’ said Tubieron, who is under the guidance of international matchmaker Bebot Elorde. The event is supported by Mandaluyong Mayor Benhur Abalos and Solar Sports. The 5-foot-7 Doliguez, pride of Malungon, Sarangani, Province, has an impressive record of 19-1-2, 14 KOs, while Tubieron sports 18-3-1, 8 KOs. Other attractions is the fight between Roberto Gonzales and Mark Sales and the bout between Jethro Pabustan and Angelito Merin.